"If atmospheric idiosyncracy is your thing then you could do worse than investigate the six track EP "Thorns, Brambles, White Water And Black Oak" by Rowan Coupland, which somehow manages to mix multi-voiced folk with avante-garde arrangements. Taking Coupland's voice as the centre of the work, a multitude of other instruments and sounds underpin the passionately sung vocals. 'Up To Heaven' is almost gospel in its anthemic, choral quality - a wonderful opener - while 'I Got Born On Sunday Morning' continues the theme of the first track, this time with a hint of blues in the singing. 'Le Réveil' is a slower, more traditionally arranged track, again beautifully sung, while 'Your Best Place' brings in another voice for a different feel. 'No Window' has a gorgeous melody and perfectly judged female vocals, while EP closer 'I Was Born In The Sun' again adds a female vocal for a fragile, though memorable conclusion. Twenty four minutes of magic." "Multi-instrumentalist Rowan Coupland is yet another of the many alternative-folk artists to come out of the thriving Brighton scene. Previously of Sons Of Noel, Thorns, Brambles, Whitewater and Black Oak represents a refreshing twist on this well-established musical community. With songs like 'Up To Heaven' and 'I Got Born On A Sunday Morning', there can be little doubt to the influence of gospel elements in the creation of this album. This is not to say that the content of this EP is particularly religious, merely that it has elements of this to it. Couplandâs voice suits this theme well, his high-pitched vocals soaring over the guitars, harps and violins evident throughout this EP. Couplandâs third solo EP is an absolute delight to listen to, and is soulful, heartfelt folk music at its beautiful best and really shows off the talent that he possesses. The aforementioned 'I Got Born On A Sunday Morning' is an acapella-like number, where we see Coupland's falsetto complimented well by a backing choir in a creative twist on traditional gospel-folk. Coupland plays all the instruments himself on this EP, dispelling the common multi-musician formula used in this type of music, but it is so well arranged that it manages to avoid sounding over-produced- no mean feat in itself. In fact, the only assistance he gets in this EP is through backing vocals - the collaboration with an unspecified (but probably from the Willkommen Collective) female singer on 'No Window' and 'I Was Born In The Sun' proving particularly enchanting. What Thorns, Brambles, Whitewater and Black Oak is at heart is a refreshingly new and different take on folk music which arguably in recent years has become a little bit samey since it started to break into the mainstream in the last couple of years. 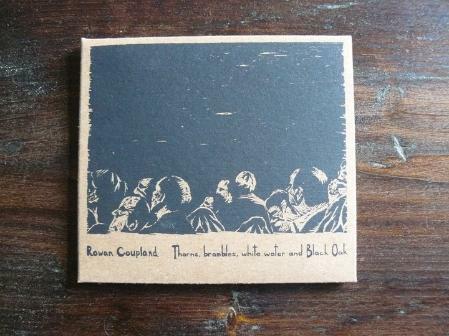 This latest offering from Rowan Coupland is enchanting, heartfelt and achingly beautiful, and deserves praise greater than his current level of fame. Folk seems to have a very tight-knit community around it, more than other genres, and perhaps more attention should be directed away from the well-known West London folk scene (Mumford & Sons, Noah and the Whale etc) and go towards this Brighton-based scene as on evidence of this release, there is certainly no disparity in the talent on show. 9/10"